Very nice set. Brush is great, not too soft or hard. Baby boy loves getting his hair brushed. My 3 year old loves them as well. Comb is great too. Would by again. I find this set very cute and has a good grip!! This set is great, nice and soft for my daughters fine hair. It's nice that there are two so she can hold onto one while I brush her hair. Love this set! Works great and well priced. Nice pink colour for my daughter. At 8 months old and not a ton of hair, the brush is good for dry and the comb for after her bath! Will get lots more use out of it!! 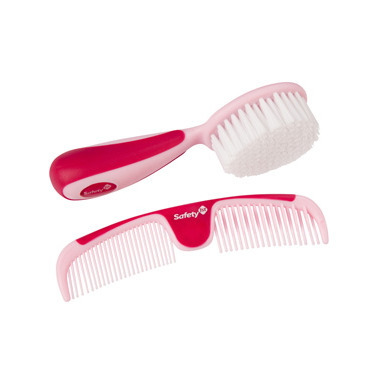 I love the pink color and my little girl has no problem when I use them on her hair. Soft brush, nice grip and nice color!